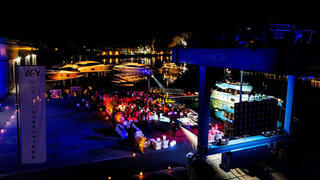 The first hull in the MCY 80 superyacht series has been launched by Monte Carlo Yachts in the Italian city of Trieste. Styled inside and out by Nuvolari Lenard, the new 24.38 metre yacht features all-GRP construction and a fast planing hull. The smooth exterior lines of the MCY 80 and shaped bulwarks aim to enhance the level of light and feeling of space on the main deck. Interior design includes brushed and bleached oak floorings, precious leather and stone features, as well as furnishings from the likes of Hermes, Armani Casa and Minotti. Key features include a Portuguese bridge, one of the most popular designer superyacht bridges and a rare feature among fast planing yachts of this size. The exact layout and engine set-up is yet to be confirmed. 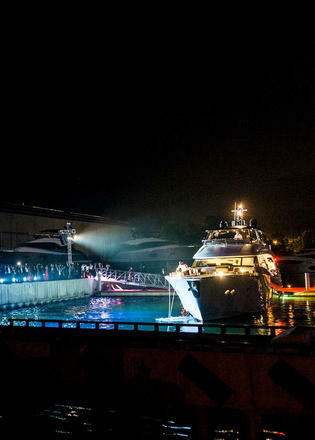 The lavish ceremony, which featured a performance from opera singers Cristiano Cremonini and Simona Ferrari, comes almost exactly 12 months after the launch of the first MCY 105, which has since been named G and delivered to her new owner. 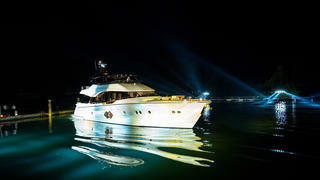 The MCY 80 was built at the Italian yard’s Monfalcone facility, which was recently expanded by 3,000 square metres with the addition of a spray booth for boats measuring over 60 metres. 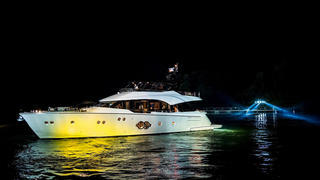 Monte Carlo Yachts added that the MCY 80 will be exhibited at the 2016 Cannes Yachting Festival.